As a signal of this country’s economic transformation, you need go no further than our lofty, mighty stations. They are a history in themselves: plotting a journey through the last 175 years: cathedrals to Britain’s industrial might; vast spans of iron, fretted and decorated, caverns to transport and the glory of steam. And these were not just temples in our capital, but throughout the country: Temple Meads in Bristol; the curving platforms of York; Piccadilly and Victoria in Manchester; even end of the line stops were impressive: Grimsby; Lime Street. Some were like castles: Carlisle or transformed the terrain itself, like Waverley in Edinburgh. Most saw turmoil and demise before being reinvented for broader and different uses. 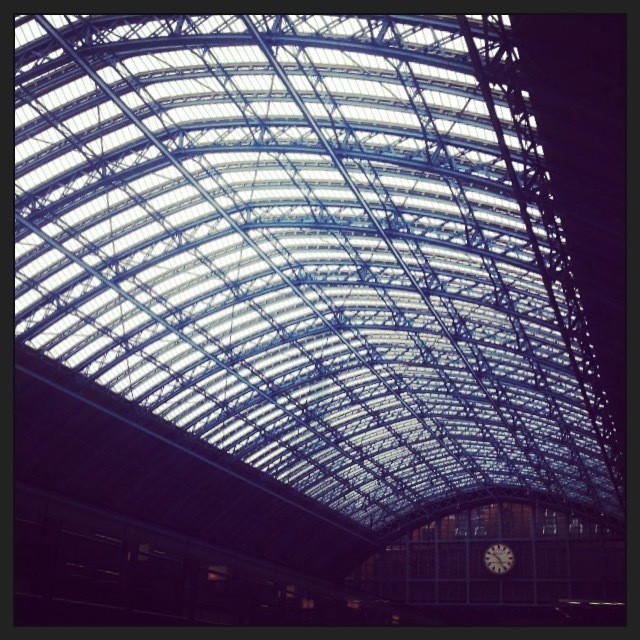 St Pancras in London is the finest. Fittingly, trains from the Continent arrive here: and what a statement: after years of political re-engineering, of turmoil; of strikes, of economic doldrum-drifting, St Pancras says, ‘London is reborn, London is back’. And if you arrive from Corby, Luton or Sevenoaks you stride purposefully forward too, dreaming the same dream. It is like a town in itself. Upstairs the daylight and nightlife: a crafty coffee in Benugo espresso bar perhaps, or a sip of Dom Perignon in a bar of a different kind; or even a Branzino* con palate e salsa in Carluccio’s, before your porter lifts your trunk into the carriage and John Betjeman waves you away Downstairs is the ‘town’; food and clothes shops; luggage, watches; a re-sole for your shoes or a simple polish; pay in a cheque or check on your family whilst hammering some honky-tonk on the old piano. Or grab a craft beer in the Sourced market, which is ironic given that the pillars between which today’s shops sit were not defined with Imperial exactitude, but rather by the more arbitrary length of a barrel of Bass’ beer – the undercroft was built and paid for by the massive brewers of Burton. Today, our engineering in particular is focused on functional. Housing companies who build 3,500 houses a year have no time for beauty; no care for individuality or bespoke design. They are about numbers not a name. Not so the Victorians. As you approach along Euston Road, Gilbert Scott’s design grabs all of you, moves you; in fact, it grabs you by the throat and punches the breath out of you. Vistas emerge and open up: through to the booking hall here; a glimpse of the vast roof there; away into the depths for the Tube this way. Beauty is in the details too. The iron roof sails away from you like a Cathedral’s flying buttress, but there, in a nook, is the name of the manufacturer, wrought in for permanence, with pride in a job well done, a legacy left. Iron was the pen and ink of the Victorian engineer. 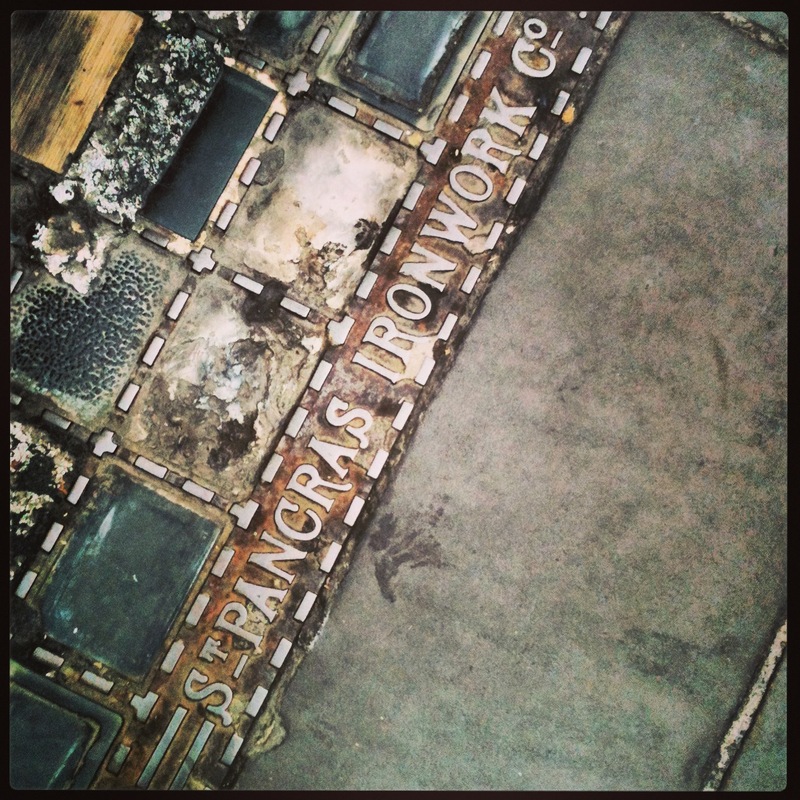 And St Pancras is not just a station but a place. And that place put its name to an iron foundry whose name crops up across the land. Not in massive structures that we cannot fail to notice; but in altogether, more ordinary, more humble work. 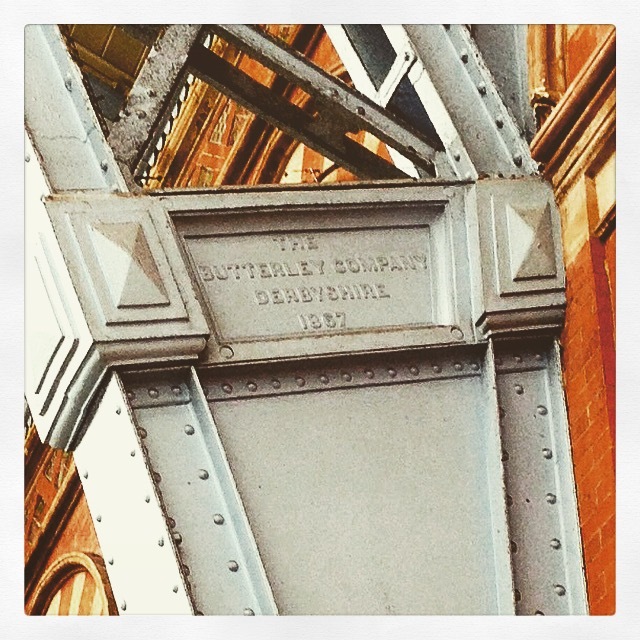 For those who care to look, there is the reward: The St Pancras Ironworks Company manufactured utilitarian iron pieces: man-hole covers, gutters; stair-treads. 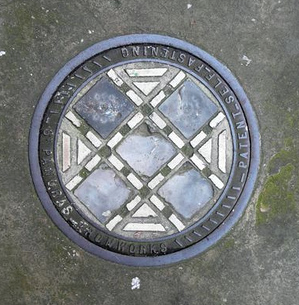 What design, what beauty in a cover for a coal chute or for a Cardiff drain . The Works has gone now, but its Product remains. In their own way, the legacy of these human sized pieces is as moving and impressive as the jaw dropping edifice to travel which more famously carries its name still. *Which, funnily enough, given who paid for the place**, is sea bass. **I shall resist the temptation, fish puns are endless. November 2012. Musings of a long distance commuter. The Principle of Selective Attention. That was it. You know how you can walk the world oblivious to something – then somehow it’s brought to your attention and you see it all the time? That was it. Just like when my wife decided to buy a new Beetle. Apparently there had been a big launch, loads of press and PR, but it had passed me by. Until my wife saw one in the street: “There!” she said, “There’s one!” You couldn’t miss it at the time – unlike anything else on the road – and that was the moment. The Principle of Selection Attention (let’s call it ‘The PSA’ as he’s an old friend now) – the new Beetle – everywhere. 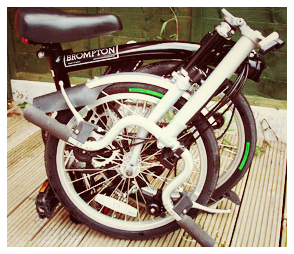 And that was it with Bromptons too. In fairness, as a cyclist, obviously I knew about Brompton’s. Ugly thing. Fold. Weird handlebars. Commuters. But they had never sunk in. A mere bike-shaped shadow passing across my consciousness; not cutting through; not managing to prioritise itself above the millions of other, more important things. Not now though. Now I work in London. Now, loathe though I am to admit it, I am a London commuter myself. And Bromptons are everywhere. Like a pestilent storm of locusts, gnashing, chomping, biting at the periphery of my vision. Swooping; darting; nipping. Next to me on the platform. There when I look out of the window. Folded under a table in a cafe. Peeking at me. Teasing me. Black ones mainly. And red. And yellow. And a few white ones. Even a pink one down Margaret Street. Then the varnished bare metal one with nice golden brazing. Seen a few of them now. And handlebars. Not all weird, up turned zig-zag affairs. Some just weirdly straight. Or only mildly bent. They even have gears. And Brooks saddles. And a bell with a particular tone. Not too effeminate that you ignore it; not too deeply resonant that it gets lost in all the urban background noise. Just right – mid tone, on the edge of annoying yet bullseye for ‘getting you noticed’. Suspension too. Old school – a massive elastomer (rubber bung) on the back wheel, for soaking up the speed bumps, potholes and inattentive pedestrian. A reflection perhaps on the svelte urbanites with low body fat who actually need some extra padding. Oh, and the engineering. These are not machines built to fail; they are built to last you a lifetime. The quality of the welding; the choice of material; the ingenuity and solidity – the beauty even – of the various folding mechanisms. And discovery. Couples pedalling across the US on Bromptons. Lands End to John o’Groats – of course; been there, done it, too late my friend. You Tube clips now being sent to me of trick riders doing moves clearly in breach of the manufacturer’s warranty. And…..damn it! I want one. I met MJ for a catch up; his life more eventful than mine it seems, refreshed me. We talk and drank coffee, ate cake. Talked more. He wanted to show me something. Up New Street, across Victoria Square, past Birmingham’s Museum and Art Gallery and it’s Victorian grandeur. And across Chamberlain Square in memory to a great Victorian Statesman. By contrast, ‘Paradise Place’ is hardly that, a ’60s concrete juxtaposition, not even of the brutalist kind, just the memorably ugly kind. But pushing on we emerged by the new library – our destination, I thought. But no. we carried on, through the ICC then along by the canal basin to emerge in the mish-mash of bars, restaurants and corporate offices making up Brindley Place. All a bit so so. Yet there, crouching off a pedestrianised & setted alley just off Broad Street was our destination. 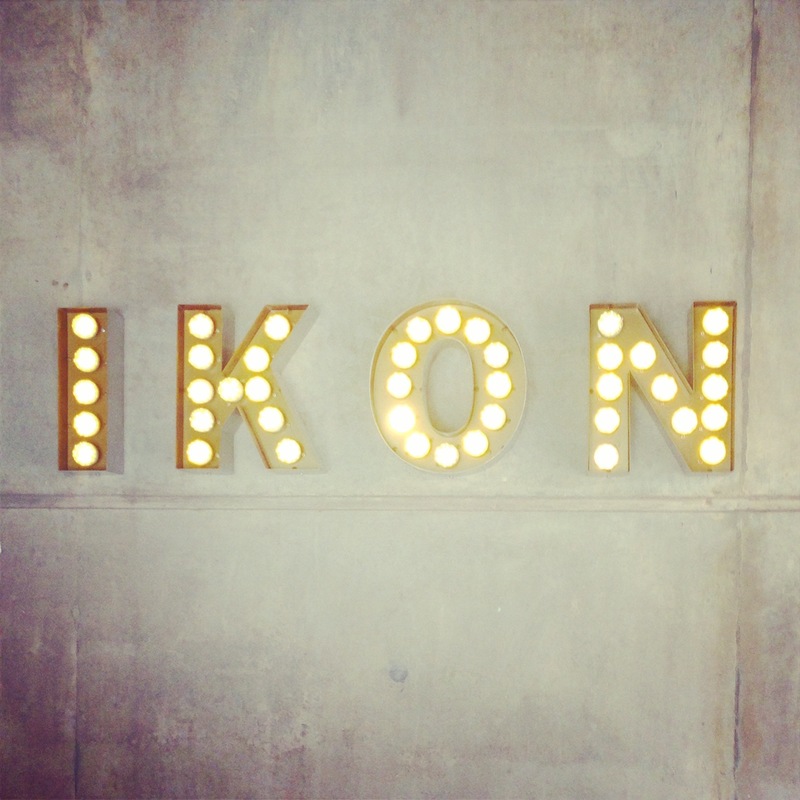 The delightfully off-centred Ikon Gallery (http://ikon-gallery.org). I wished I had been more prepared mentally, as it was it was all a bit of a mental assault. 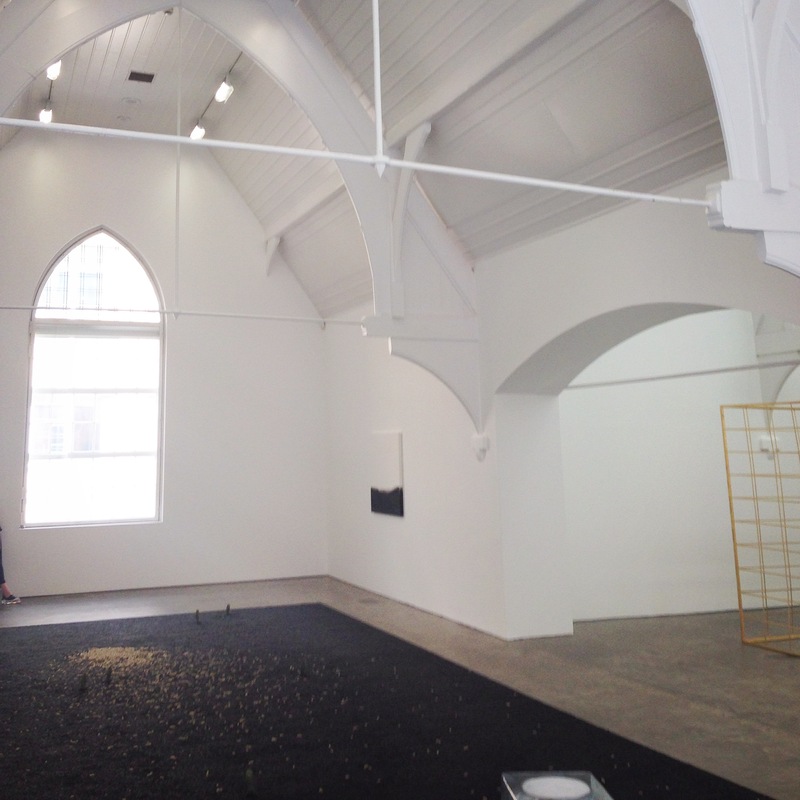 MJ talked me through some of the pieces – but what struck me was the space. Some, open, clean, airy. Others, darker, cavernous, troglodytic. Worshippers stood in muted silence, in awe. Other gaggles giggled and moved on. Go there. Enjoy the art. Enjoy the space.